Amazon has just announced its 2 latest local Kindle Stores. As of this morning,you can buy ebooks at amazon.es/Kindle and amazon.it/Kindle. 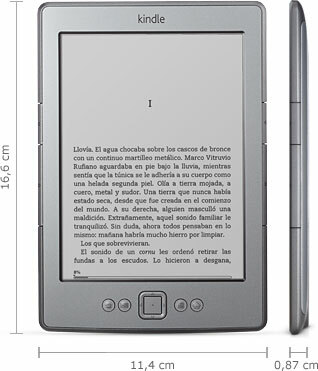 There's thousands of ebooks in each store and a Kindle with appropriate language support. The Spanish Kindle Store has over 22 thousand titles, including 1,000 free Spanish language classics, while the Italian Store has 16,000 titles. Both also draw from the nearly a million primarily English language titles offered internationally via the Kindle Store. Amazon is also boasting that it offers a selection of best sellers in Catalan, Basque and Galician in the Spanish Kindle store. I don't have any current details on the Spanish market, but my most recent figures for Italy suggest that Amazon has more Italian language Kindle ebooks available than you can find in Epub. Up until this launch, Epub was the dominant ebook format in Italy with 13 thousand titles available. And I do have older info on Spain, and that suggests that around 10,000 titles were available as ebooks before the Kindle Store launched. So Amazon, just by launching a Kindle Store, is now the dominant player in each of those countries. Smooth. Both Kindle stores are boasting that you can get the K4 for 99 euros with appropriate language support, but we already knew that would happen. This is Amazon's stripped down model with no sound, limited storage, and no keyboard or touch screen, but it's still usable. While the other Kindles should also be able to read Spanish and Italian ebooks, they don't have the same language support in the menus or on the keyboard. If they did then I would suggest that you upgrade to the K5. BTW, Amazon doesn't specifically mention it in the press release but several apps also added support for Spanish and Italian in the past month or so, including the Kindle iPad app, as well as the Windows and OSX apps. I'm sure you already have the updated apps, but if you're just starting out then you should probably get them. They give you more options. On a related note, Amazon is also expanding the 70% royalty option to include Spain and Italy. Authors and publishers ho distribute their ebooks via the KDP (and agree to Amazon's terms) can now get the higher option when an Italian or Spanish customer buys their ebooks, just like they can for customers in the US, UK, Germany, Austria, and France. This Italian website claims the number of italian ebooks to be 17.148. I think this number refers to epub. You can see the number on the bottom of the page. My info is about a month and a half old, so I could be wrong. Thanks!